Making a meal of dishes featured in Andrea Camilleri’s novels about the Sicilian police inspector Salvo Montalbano seems to have become an annual event for me. When, in the middle of an investigation, our hero is struck by “his customary wolflike hunger,” the meals he eats are described with such gusto that I’d give anything to be able to join him at the table. 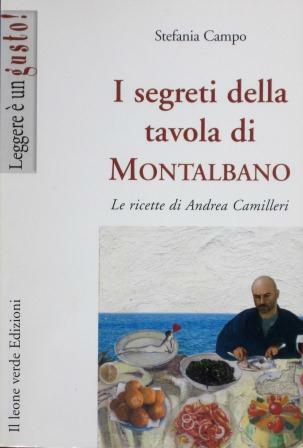 That not being possible, my next choice is to page through Stefania Campo’s I segreti della tavola di Montalbano: Le ricette di Andrea Camilleri and plan a dinner around some of that cookbook’s recipes. I’ve written about my results here four times in the past four years; so to keep up the tradition, here’s this year’s installment – one dish from each of three of the novels, which I made for a small dinner party with friends who are also Montalbano fans. 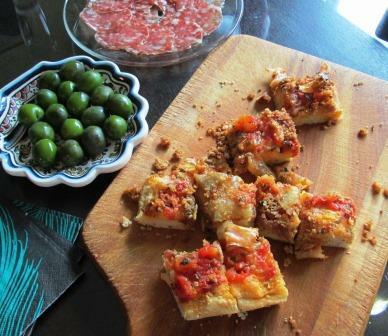 With aperitifs in the living room, I made a sfincione, which is a kind of focaccia or thick-crust Sicilian pizza, very popular even here in the US, that’s mentioned in Excursion to Tindari. Montalbano himself doesn’t eat this. He hears about it from a garrulous old citizen he’s questioning, who tries to describe the entire meal his nephew, who lives in Tindari, served him on the day of the titular excursion – starting with a sfincione. The book’s recipe calls for already-risen bread dough (purchased, presumably), into which you are to knead grated pecorino, lemon juice, olive oil, and salt. I made my own dough, using my favorite focaccia recipe. 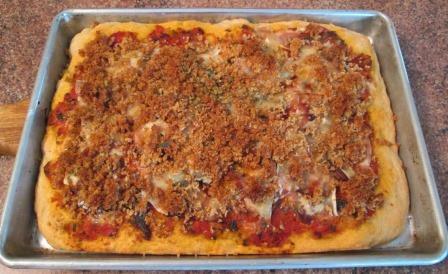 I pressed it into a pan, spread over it a quickly made tomato-onion sauce, dotted it with bits of anchovies, strewed on shavings of caciocavallo cheese, and baked it in a hot oven until just barely done. I did all this early in the day, so in the evening all I had to do was add a topping of fine breadcrumbs sauteed in olive oil and return the pan to the oven for 10 minutes. Cut into small squares, the sfincione was a very tasty snack. We made short work of it. Of the day’s three dishes, this was the most unusual one, which I was most eager to make: octopus croquettes. One of Montalbano’s two favorite restaurants is the eponymous trattoria of his friend Calogero. In The Smell of the Night he arrives there at lunchtime with that wolflike hunger of his and eats spaghetti in squid ink followed by a dozen fried octopus meatballs. They sounded fascinating, but since I had never even heard of making croquettes from octopus, much less tasted any, I didn’t want to chance them as the main course of my dinner party, so I made them as a hot antipasto. I had already-cooked octopus tentacles in the freezer, left over from a previous cooking event. We put them through the meat grinder (those are Tom’s hands in the picture) and I mixed in grated pecorino cheese, bread soaked in white wine and squeezed almost dry, garlic, parsley, and an egg. I shaped the mixture into balls, put them in refrigerator for a few hours to firm up, dipped them in egg and then breadcrumbs, and fried them. All this this was early in the afternoon. At dinner time I reheated the croquettes in the oven. Alongside, we served cut-up lemons and a spicy tomato sauce (Tom’s idea and invention). With great curiosity, everyone tasted them. Oh, dear! While they were perfectly acceptable croquettes, they had no flavor of octopus. 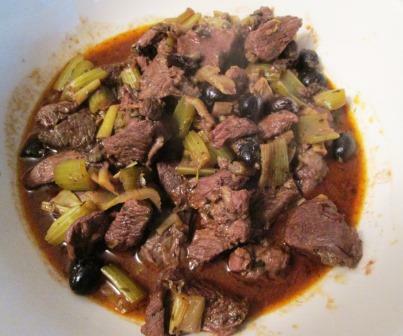 Squeezes of lemon brought out a hint of it, but so mildly that the basic ingredient could have been any white meat – chicken, pork, veal, even alligator or rattlesnake. I suspect it was the pecorino that masked the flavor of the octopus, but you couldn’t even taste cheese as such. We all ate a few, but the dish was a letdown – edible, certainly, but far from exciting. I can’t believe Calogero wouldn’t have made it better. It was a pleasant enough lamb braise. But it would have seemed much more Sicilian to us – and probably more interesting – if it had been made with swordfish rather than lamb. I’ll bet Montalbano would have liked it that way too. The lamb I cooked a whole day in advance, since stews and braises generally taste better if given some time for their flavors to develop and blend. Which they did, but not in a way as to really excite our palates. On the positive side, none of these three dishes seemed to have been at all harmed for having been done in advance and reheated. A very useful attribute for a busy dinner-party cook. Thanks for a good read. I will have to try another Montalbano mystery. (I read The Voice of the Violin at your suggestion.) I must say I don’t know where you find the energy for your dinner parties. I would collapse in a heap when the guests have gone. That’s exactly what I do — and then Tom sweeps me up and puts me to bed. P.S. Try The Terracotta Dog next — it’s my favorite.